In 1880 Alexander Graham Bell invented the photophone. Bell considered this a greater discovery than his other invention, the telephone. With the photophone, Bell would speak into a microphone, which would then cause a mirror to vibrate. The sun's light would strike the mirror, and the vibration of the mirror would transmit light across an open distance of about 656ft (200m). The receiver's mirror would receive the light and cause a selenium crystal to vibrate, causing the noise to come out on the other end. Although the photophone was successful in allowing conversation over an open space, it had a few drawbacks: it did not work at night, in the rain or if someone walked between the signal and receiver. Eventually, Bell gave up on this idea. It was not until the 1950s that the laser was invented. This device was a finely controlled beam of light that could transmit information over long distances. Unfortunately, the same drawbacks experienced by Alexander Graham Bell also plagued the laser. Although it could be used at night, it did not work during rain, fog or at any time a building was erected between the sender and the receiver. Dr. Robert Maurer, Peter Schultz and Donald Keck of Corning Incorporated in Corning, New York, came up with the first low loss optical fiber, with less than 20dB/km (decibels per kilometer) loss. Today, single-mode, premium grade fiber is sold with specifications of 0.25 dB/km or better. In 1977 Corning joined forces with another technological giant, Seimens Corporation, to form Siecor. Corning's extensive work with fiber, coupled with Siemen's cabling technology, helped launch a new era in optical fiber cable and associated products. Today, Siecor is a world leader in the manufacturing of fiber optic cabling system products for voice, data and video communications applications. 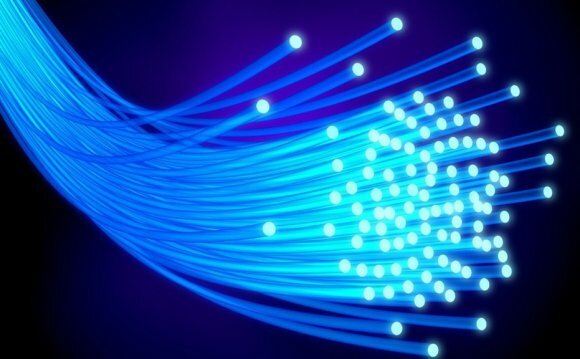 In its simplest form fiber optics is a medium for carrying information from one point to another in the form of light. Unlike the copper form of transmission, fiber optics is not electrical in nature. A basic fiber optic system consists of 1) a transmitting device, which generates the light signal 2) an optical fiber cable, which carries the light and 3) a receiver, which accepts the light signal transmitted. The fiber itself is passive and does not contain any active, generative properties.